MPTK is based on SoundFont, a kind of library which contains hundred sounds of instruments as piano, sax, drum, … with the description (quite complex!) of how to use each sounds for each keys and velocity. The FREE version of Midi Player Tool Kit use the SoundFont GeneralUser_GS_SoftSynth_v144 from Christian Collins site here. It’s a SoundFont with a very good balancing between size and quality. Thousands SoundFonts are available on the web, often for free. Keep only banks of interest for your application. Analyse your Midi files to keep only patchs necessary. Analyse your Midi files keys and velocities to keep only waves necessary. So, you keep a low volume of files for your application or game. Don’t forget to have a look to the Christian Collins site here which contains a lot of interesting information. Remark: the current version of MPTK (version < 2) handle a simplified SoundFont synth to avoid heavy calculation (no Modulator and only the essential Generator as Key, Vel, Pitch, Sample, …). I’m working for a version 2 with a more sophisticated synth. Download SoundFont on your computer, see above. Click on “Add SoundFont“: choose a SoundFont (filename of type .sf2) on your computer that you have already downloaded and load it in Midi Player Tool Kit. Default bank for sound as Piano, Sax, Organ, Guitar is defined to bank 0. Often the first bank contains a well selected variety of instruments. 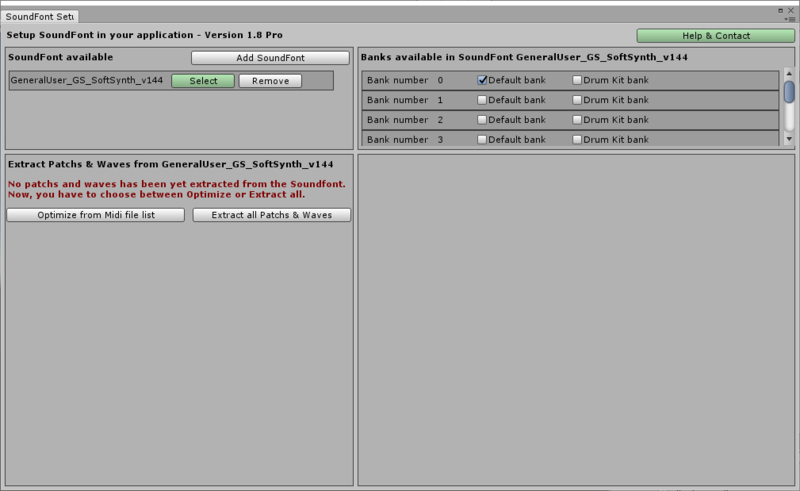 Default Drum Kit bank for drum sound is often the last bank. You can change these defaults values in the top right sub windows. Banks not used will be stripped. ​”Select”: select the default SoundFont to use when playing Midi files. Only one SoundFont can be selected at the same time. But it’s possible to shift SoundFont when running. “Remove”: delete the SoundFont and all sounds associated to it. Next you have the choice : optimize your patches list depending on the Midi files defined in MPTK or get all patches available. Click on button “Optimize from the Midi file list” : each Midi Files (set with MPTK – Midi File Setup) are analyzed to detect patches and waves used. 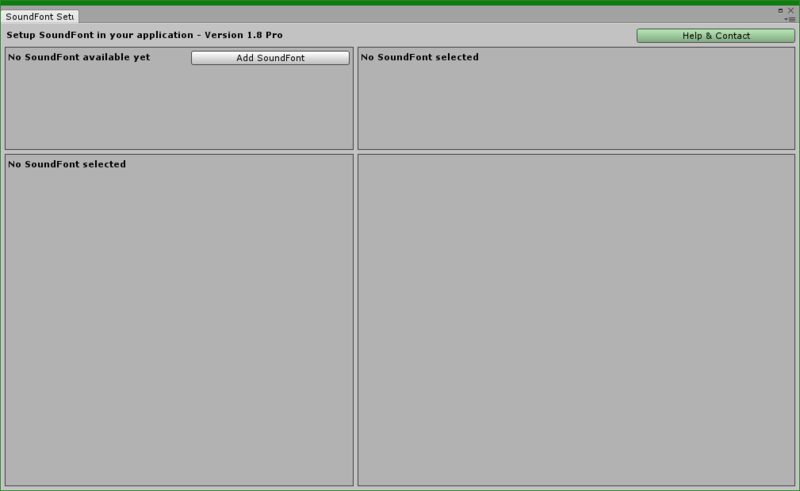 Patches and waves not used are stripped from the SoundFont to reduce the size of your project. A simpler format of SoundFont is created. Click on button “Extract all Patchs & Waves” to get the content of the two banks selected for the SoundFont. It is useful if you want to transpose music when playing or have not yet defined your Midi files. Free Version is published with the SoundFont “GeneralUser_GS_SoftSynth_v144”. It’s a free sound font with a good balancing between size and quality but you can’t change it. To download the same SoundFont as for the free version, you could visit the excellent Christian Collins’s site.